Specimen plants are mature plants that carry a spectacular number of flowers, preferably uniformly distributed so that the plant is covered with blooms. Depending upon their appearance, they may be awarded either a Club Cultural Certificate or the prestigious OSCOV Cultural Certificate. 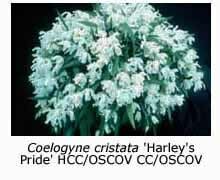 According to the OSCOV Judging Handbook, “A Cultural Certificate is available to the grower of an orchid that is clearly superior in flowering, size or robustness of growth, to that which could reasonably be expected for a mature plant of its type. 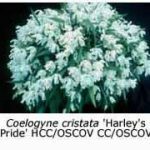 It must have been owned and grown by its owner for at least two years.” Despite the latter wording, most plants receiving OSCOV Cultural Certificates are as much as ten years old or more. In addition to the floral requirement, it is important that the plant should show signs of good culture – the foliage should be clean and unblemished, with no sign of damage (past or present) by red spider, scale or other insect pests. Nor should there be any sign of trimmed leaves, which the judges take as evidence of leaf tip dieback, a cultural fault. 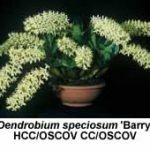 Some orchids are much easier to grow into specimens than others, those with a branching habit being much more likely to develop into specimens than those which produce only a single growth each year. For example, the most recent growths of species such as Encyclia (syn. 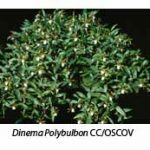 Dinema) polybulbon or Oncidium uniflorum produce two or three new growths every year, each of which flowers in turn. Thus, well-grown plants of these species usually carry twice the number of flowers as in the previous year, even though each growth flowers only once. Incidentally, both of the above species are easier to grow into specimens if they are mounted, rather than potted. As stated earlier, it may take ten years for an orchid to grow to specimen size; many mounts will last this long without deteriorating, but most potting mixes will need to be renewed several times, the plant perhaps suffering some setback on each occasion. 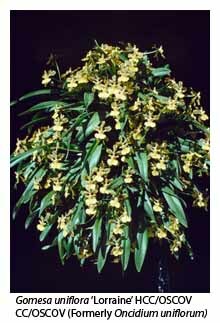 Orchids that flower several years in succession from the same growth are ideal candidates for growing into specimens. 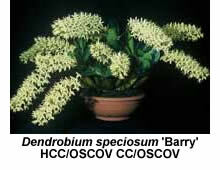 Many Australian native dendrobiums fall into this category. Eventually, however, some of the older growths will have exhausted their flower nodes, and may perhaps have lost their leaves. It will be necessary to remove these leafless canes when the plant is re-potted. Carefully sever the rhizome between the older canes and the newer growths, remove the old canes, and then fold the newer growths so that they form a tidy circle. 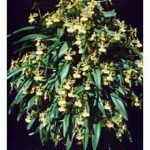 At show time one regularly sees impressive Australian native specimens of Dendrobium kingianum, D. falcorostrum, D. Delicatum and D. Bardo Rose. 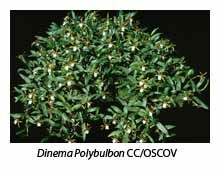 Perhaps the biggest challenge in growing specimen plants is in keeping pests, such as scale and red spider, at bay, because the damage they cause to the foliage persists over many years. Fungal infections may also mar a good specimen plant, the resultant leaf markings remaining in evidence for the life of those leaves. Many a plant otherwise worthy of a Cultural Certificate has been rejected by the judges because of its blemished leaves. Incidentally, Cultural Certificates are awarded to the grower, whereas all other awards are granted to the orchid under consideration, not the owner. The recipient of a Cultural Certificate can feel justly proud, because it acknowledges his or her cultural skills and vigilance over a prolonged period.